“October might signal fall for some, but for pizza lovers, it means one thing: National Pizza Month! Pete’s New Haven Style Apizza will celebrate National Pizza Month throughout October long with “31 Days of Pizza.” Each day of October, Pete’s will offer $2 slice specials on a different “pizza of the day” ranging from its popular and eponymous clam-topped New Haven pie to the Metro-North topped with slow roasted pork and housemade pancetta. With more than 20 different specialty pizzas and countless customizable topping options, guests can explore and expand their pizza horizons. 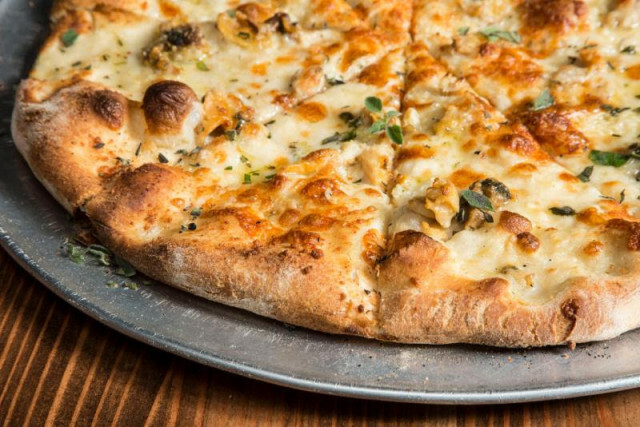 National Pizza Month was created in 1984 by the founder of Pizza Today Magazine to honor all-things-pizza, and Pete’s New Haven is excited to celebrate this delicious holiday and educate diners on what New Haven-style apizza (pronounced “a-BEETS”) really is. Each day from October 1st through the 31st, Pete’s will announce the “Pizza of the Day” on social media, and offer $2 slice specials on different varieties of its New Haven-style pies throughout the month. Specialty pizza options will range from the classic, signature New Haven with Clams, Garlic, Oregano, Extra Virgin Olive Oil and Pecorino Romano, Metro-North with Slow Roasted Pork, Caramelized Onions, Ricotta and House-made Pancetta, the vegetarian Edge Of The Woods with Fried Eggplant, Sautéed Spinach, Onions and Ricotta, and the Wooster Square with Broccoli Rabe, Hot Sausage, Milano Salami, Extra Virgin Olive Oil and Parmigiano-Reggiano. Pete’s New Haven Style Apizza New Haven apizza is characteristically lighter and Neapolitan-style, with a thin and distinctly charred crust, crispy on the outside and chewy on the inside. Toppings are fresh and simple, which Pete’s sources from local farms. Pete’s also accommodates allergies and dietary restrictions, with a variety of gluten free, vegetarian and vegan options. Adequate Reforms for DC Fire and Emergency Medical Services?